According to the state tax department, diners spent more than $910 million eating out in Vermont in 2013. The state has become a destination known for its locavore food, beer and spirits and a surprisingly sophisticated array of specialty products. A 2011 study commissioned by the Vermont Agency of Commerce & Community Development reported that the tourism industry is growing fast. Visitors pumped more than $1.7 billion into the state that year, up more than 20 percent from just two years before. So why do relatively few young Vermonters see tourism and hospitality as a career path — or at least one that justifies investing in a college degree? As college enrollments continue to drop nationwide, Vermont's hospitality and tourism management programs are feeling the squeeze. Many industry professionals say that's bad news, not only for the restaurants and resorts but for the state as a whole. Though a few Vermont schools offer resort-centric management programs, food-industry curricula appear to be on the wane. In 2010, Champlain College canceled its hospitality management program; Southern Vermont College nixed a two-year program years ago. The only schools that continue to offer significant coursework in food and beverage management are New England Culinary Institute (NECI), Johnson State College (JSC), Community College of Vermont (CCV) and the beleaguered Burlington College. Starting this fall, Johnson's program will change from a full four-year major to a concentration within the business department. CCV's enrollment remains modest — fewer than 30 students are currently signed up for the associate's program, according to associate academic dean Darlene Murphy. Todd Comen, a JSC hospitality management professor, says he finds the weak enrollment numbers perplexing. "It's always been a big question to me," he says. "Why are there not more students from Vermont going into hospitality programs? It's one of the largest industries here. It's hard to fathom." At Champlain College, former program chair Peter Straube says the school chose to do away with the program in the midst of a college-wide restructuring. 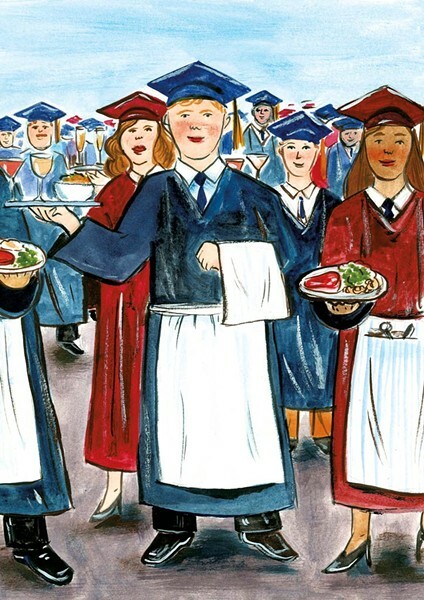 But Straube — who spent nearly two decades in the service industry — acknowledges that many parents seemed to question whether a hospitality degree was a good investment for their children. "I think [they] were just not seeing that it was worth 40 grand a year for that career path," Straube says. "That may or may not be accurate." The hospitality industry has always had an image problem, he adds, and that may scare some prospective professionals away. "We all go to restaurants and hotels, and we think we know what [these places] do, but we don't know what the management does. It's a complex industry," Straube continues. "When you think about it, how many things [is a restaurant] doing? It's manufacturing, it's retail, it's management, it's customer service, it's show biz, it's accounting and finance and all of these things." At NECI, executive chef and chief operations officer Jean-Louis Gerin says many would-be service professionals fear they won't be taken seriously. But he also notes that the service industry — and the public's perception of it — is shifting. "When I first arrived in this country in 1983," Gerin says, "a parent would never say, 'My son wants to be a chef.' Now it's a very respected way of making a living. I hope and believe it will be the same for the front of the house. Someone will be able to say, 'I'm a manager at that restaurant' or 'I'm a sommelier at that restaurant,' and that will be respected." Success in the business demands a genuine affection for serving and a devotion to detail. "To be a [professional] waiter is a new job in America," Gerin says. "It was always people who were aspiring actors or waiting to do something else. The notion of making a career out of it is new." Given that newness, the profession is often misunderstood and misinterpreted. "There is a big difference between serving the public and being a servant," the NECI chef says. "We have to change the perception of it, [and] that has to come from the public first; when you're dining in a restaurant, how are you treating your waiter or waitress?" But, he says, change "will come. I have great hope for that." Gerin's hope has translated into expanded programming at NECI. Three years ago, the school beefed up its two-year food and beverage management program to form a new bachelor's degree, and students have responded well. "Front-of-the-house management was never a large program at NECI," Gerin says, "but this new BA program is getting far more traction than the associate's program ever had." The curriculum, Gerin says, focuses on the soft skills that tech programs often neglect. "Every school is going to teach you food costs and scheduling and point-of-sale," he says, "[but the BA program] focuses on the people and administration side and what the customers don't see. How do you manage a team so that it's more efficient and people are happy?" JSC alumnus Chris Benjamin worked as a NECI instructor and ran the school's restaurants for a time before taking the reins at Burlington's Skinny Pancake crêperie as general manager. He holds hospitality education in high esteem and says he wishes more food and beverage workers would go to school. "The degrees are huge; we would definitely benefit from more of these graduates," he says. "There are only so many jobs in the state of Vermont, and I think the degrees are valuable. To lose these programs would be a real shame." Benjamin also says he's more likely to employ a candidate with a service education. "If it's between you, with a ton of experience and no degree, and someone with the degree and that same experience, I'll hire the degree every time," he says. "Because I know all that they've learned." Skinny Pancake managers at both the airport and Lake Street locations are NECI grads. "I brought them in as assistant managers and promoted them to general managers," Benjamin says. "They have the drive, and they take it seriously, and they've done well. When you've invested time and mental acuity into your profession, you're going to be more on top of things." JSC's Comen says hospitality graduates are more likely to succeed than people who just fall into service work as they look for jobs in their chosen field, and he suggests that management programs are key to the health of the state. "Without programs like this, we just aren't getting new professionals coming down the pipeline. It requires professionalism to compete with other states that have places like Disneyland," he says. Comen confirms that people like Benjamin, who are doing the hiring in hospitality, seek educated employees. "Industry veterans are very focused on emphasizing education," he notes. "They're all really well educated, whether it's in hospitality or some other field." Because Johnson's program — or what's left of it — is embedded in the school's bachelor of arts in business program, Comen says, "Our students are getting a well-rounded view of the world" in addition to hospitality-specific skills and background in ethics, law, point-of-sale instruction and management protocol. "That's very important in service," he adds. "In Vermont, we rely heavily on tourism, and we really need professionals." Benjamin says his degree continues to serve him. "The program certainly provided a lot of the basic building blocks you need to run a restaurant," he says. And the skills required in the hospitality business — accounting, human relations, customer service — are not wasted on other industries, argue two other JSC grads. Elga Gruner is a 2002 alumna and now the school's assistant director of admissions. She says her degree, along with years of working in customer service at the Stowe Area Association, prepared her for the work she's doing now, even though it's neither hospitality nor tourism. "Admissions work is pretty similar to what I was doing [in Stowe]," she says. "It's essentially customer service and marketing; we're just selling different things." After going to school and spending years in the field, Gruner says she's learned that "Whatever you do requires customer service ... When you study service, you do give better service. There's that next level that people are not aware of if they don't get that education." Warren Ramsey, a 2012 JSC graduate who works as a hospitality entrepreneur in Washington, D.C., agrees. He's in the business now, but admits he may switch to another industry. "[This degree] has opened up a broad range to do a lot within any industry, whether that's hotel, food and beverage, accounting, finances, whatever," he says. "It broadens the number of career fields you can be a part of." And, Ramsey notes, Vermont needs more graduates like him. "The service and hospitality industries are huge in Vermont," he says. "They're thriving and growing beyond belief." The original print version of this article was headlined "Looking for a Few Good Grads"